National Public Lands Day on September 30 honors the old notion of “the commons” — a cultural or natural resource that is available to everyone. A simple, elemental public benefit. The day celebrates this idea by encouraging people to volunteer their time to help steward and maintain our public lands. These are the places we love most, from the humble, steadfast neighborhood pocket park, to the big vacation destinations like Yosemite National Park. The day is also a fee-free day for national parks, other public lands, and many state parks. As National Public Lands Day approaches, and the work to defend our national monuments continues, I think about the places I love most, where I’ve spent time with friends and family. In awe at the basalt formations of the Devils Postpile National Monument; gaining perspective at the foot of an ancient, towering giant sequoia in the Giant Sequoia National Monument; and experiencing pure joy at the continent’s edge, protected by the California Coastal National Monument. This year, along with celebrating the commons, unfortunately, comes trepidation, as we face the threat of eroded protections for our public lands at a scale never seen before in U.S. history. In late August, millions of Americans awaited news about the fate of our beloved national monuments, 27 of which were under review by the Department of the Interior Secretary Ryan Zinke, as directed by an April Executive Order from the Trump administration. Secretary Zinke’s recommendations were delivered to the White House on time, but the details of his report were not made public. As summer drew to a close, tribes, anglers, hikers, nature lovers, and conservationists had to keep waiting. Ahead of Secretary Zinke’s report being completed, a historic outpouring of public comments in support of our national monuments made the news. More than 2.8 million Americans submitted formal comments to the Department of the Interior about the monuments under review, and 99 percent of the comments made were in favor of maintaining and protecting these wild and beautiful places. Comments specific to the Giant Sequoia National Monument — a national and state treasure sheltering most of the world’s remaining ancient giant sequoia — were overwhelmingly supportive, too. More than 95 percent of the comments made expressed the desire to leave the Giant Sequoia National Monument at its current size. 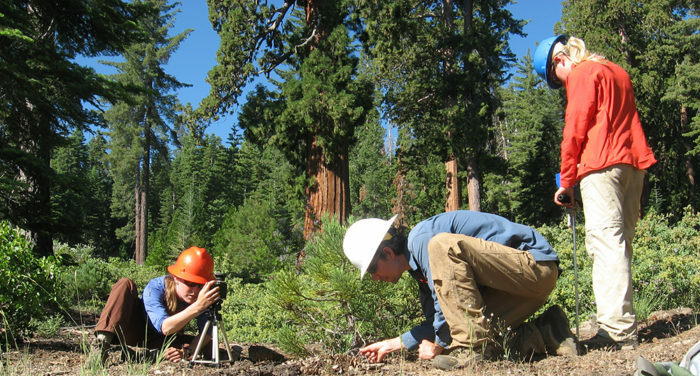 Save the Redwoods League has been working in partnership with several conservation organizations to defend the Giant Sequoia National Monument, and you can read about that effort on our Giant Thoughts blog. Ten national monuments are being recommended for modification, including changes to management plans, with four of these in the west facing boundary reductions. The four western monuments recommended for reduction are Bears Ears and Grand Staircase Escalante in Utah, Gold Butte Mountain in Nevada, and Cascade Siskiyou in Oregon and California. No mention was made of the six other national monuments under review in California, including the Giant Sequoia National Monument, leaving them still at risk of having their protections weakened. What will the Trump administration do with Secretary Zinke’s recommendations? That remains to be seen, as the White House has only said that the leaked memorandum is still being reviewed. Presidents have rarely changed monument boundaries since the Antiquities Act was created in 1906. Legal scholarship is clear that Presidents may create monuments using the Antiquities Act, but the law does not allow Presidents to change or do away with existing monuments — that requires an act of Congress. In the few instances a sitting President altered an existing monument, no legal challenges were presented. Given the broad support our monuments have today, the Trump administration will most certainly face legal action should recommendations to reduce or otherwise alter these monuments be enacted. In the case of Bears Ears National Monument, which has served as a lightning rod for Secretary Zinke’s attention during this opaque review process, the Bears Ears Intertribal Coalition has promised to fight for the monument through litigation and ongoing advocacy. The national monument took over 80 years to be designated, and its supporters are ready to defend it at its current size. Numerous environmental organizations from the local to the national level are working to maintain protections for California’s national monuments, such as the Giant Sequoia National Monument, which Save the Redwoods League will continue to defend and help steward. If anything should bring hope to the situation, especially on National Public Lands Day, it should be the commonality that shines like a bright thread woven through all the rhetoric. In addition to traditional conservation and environmental interests, tribal governments, sportsmen’s groups, youth groups, veterans, elected leaders from the local to the federal level, and business associations have all expressed unwavering support for our national monuments, by a huge majority. Once the facts are reviewed, it’s easy to understand why this is so. The Giant Sequoia National Monument is part of the engine driving a $92 billion outdoor recreation economy in California (external link). Since the Giant Sequoia National Monument was designated in 2000, average earnings in the region have increased by $625 each year, greater than the five-year average before designation. Total employment in surrounding counties has also increased by 20 percent over the same period despite the Great Recession, which ravaged other rural communities. Most of us share an unvarnished love for our public lands because that is where we play, learn, earn money, give back, and find community. So, on National Public Lands Day, don’t wring your hands. Get them dirty by building a trail, pulling some weeds, or picking up any litter you see. For a list of upcoming volunteer and other events, check out our events page. To stay up-to-date on the national monuments issue, with special focus on the Giant Sequoia National Monument, sign up for our e-newsletters or follow us on Twitter and Facebook (external links).